The Peanuts Movie is coming out soon. 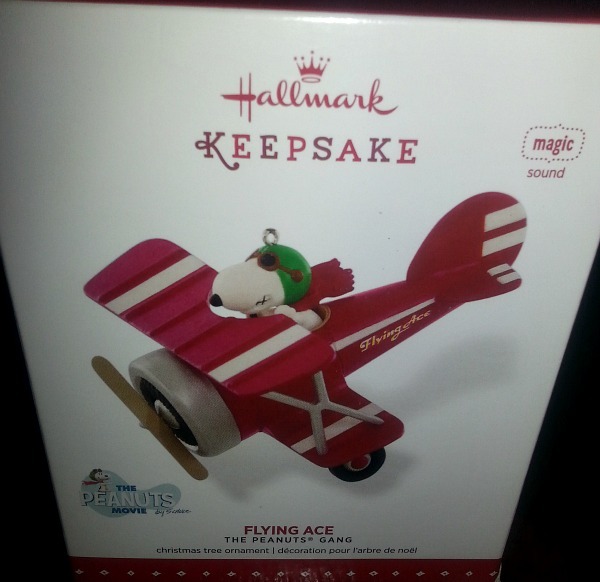 Let's celebrate with a Peanuts Flying Ace Ornament giveaway. Hallmark Keepsake ornaments are adorable. Look at Snoopy, he is so lovable. There is a whole bunch of ornaments you can check out here of The Peanuts Gang. Collect them all and make a fun tree for the family. There is also a Sweepstakes going on to win a private movie premiere. Peanuts Flying Ace Snoopy has magic sound. 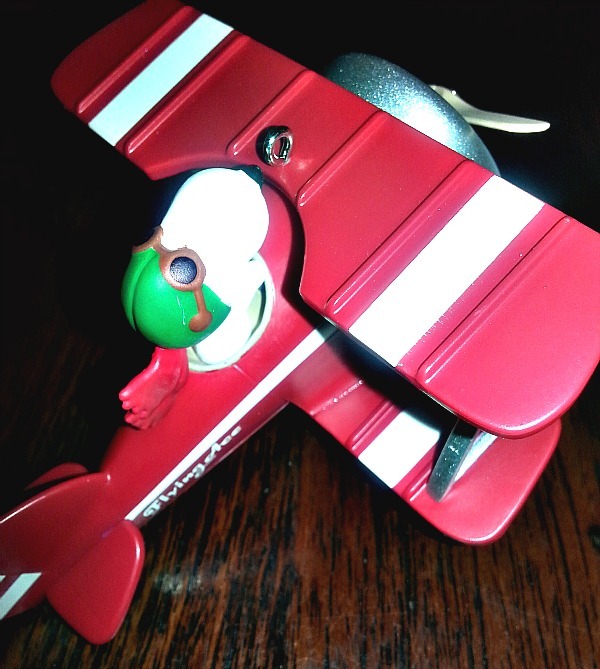 Press the button to hear the Flying Ace sound off. These keepsake ornaments are artist crafted. This one is battery operated which is included in the box. The artist for this ornament is Jim Kemme. I think this will be a lovely addition to our ornaments. My daughter already thinks its her toy. She likes to play with the ornaments and our mini tree. We look forward to collecting all different types of Hallmark Keepsake ornaments. I am so glad our local Hallmark store is right around the corner. When I was a little girl my mother let me pick out a special ornament every year. I hope to do the same tradition with my children. It will be fun to see what they choose. Now for the exciting part. You have the chance to win this ornament for your collection. Giveaway is for US, and 18+. Use the rafflecopter entry form below. Sponsor will mail prize to winner. Update: Congrats to Winner Elizabeth. I love the Peanuts Winter Fun With Snoopy Ornament! I like the Seasoning's Greetings Stainless Steel Salt and Pepper Shakers. I like the Peanuts® Special Edition Nativity Set. I like the Charlie Brown Peanuts® Gang Christmas Light Show ornament too. They've got lots of cute ones, don't they!! I like them all, the 50 year snoopy on the dog house is cute! Shepherd Linus. Definitely Shepherd Linus. I like the Lucy Peanuts® Gang Christmas Light Show ornament!!! Peanuts® A Snoopy for Christmas Ornament becasue Charlie Brown is surprise it is Snoopy in the present. I love the Snoopy + Woodstock Christmas cards! I wish they had an ornament of Lucy pulling the football away from Charlie Brown. I like the Winter Fun w/ Snoopy ornament. I like the Charlie Brown Peanuts Gang Christmas Light Show ornament. I love the Peanuts itty bittys! I love all the itty bittys, they're so cute. I really like the Peanuts® A Snoopy for Christmas Ornament. I love the Peanuts Linus Figurine....so cute and reminds me of my son! I love the Peanuts: A Snoopy or Christmas Ornament..cute! I am in love with the Peanuts® Snoopy's Doghouse Porcelain Ornament! The bookends with Snoopy are really cute. I love the Itty Bitty Snoopy. Very cute! Oh I also really love the Peanuts® Merry Rockin' Christmas Snoopy Interactive Stuffed Animal! Oh he would love that too! He is so in love with Snoopy! Peanuts® 2015 Believing Figurine makes me smile. I really like the Snoopy and Brother, Olaf, figurine. That is too cute. I love the Peanuts® Special Edition Nativity Set . I also like the home sweet home ceramic tile and the friendship wall art. Super cute items! i love the Linus and Blanket snow globe. I'd love to have the Peanuts® Special Edition Nativity Set. i like the Snoopy and Brother, Olaf, Figurine. I love the Peanuts special edition nativity set. I love the Itty Bittys!! So cute! I just love the itty bitty snoopy stuffed toy, but there all cute. I love the nativity set because I collect them. OMG! I love it ALL!! I have always been in love with the Peanuts gang....esp Snoopy! I would love to have the Peanuts Holiday Tervis Tumbler with Lid. I like the 50 Years of Charlie Brown ornament with Snoopy dancing on the piano. I always loved that scene. The snoopy and brother is the one I dig the most. I like the Jumbo Classic Snoopy. i love the Peanuts® Snoopy's Doghouse Porcelain Ornament. I like the Peanuts® Gang Christmas Light Show Collector's Set. Every year I get my kids a special ornament that somehow represents so etching that was happening around Christmas for that year. This would be perfect. Snoopy ittty bitty so cute. I love the Peanuts nativity set. I love the Peanuts Gang Christmas Light Show Collector's Set! I love the stuffed characters with sound and the greeting cards. I love the Snoopy Peanuts® Gang Christmas Light Show ornament. I really love the Woodstock Peanuts® Gang Christmas Light Show!! I love the Peanuts® Peppermint Patty in Car Water Globe. I like the eanuts® Merry Rockin' Christmas Snoopy Interactive Stuffed Animal . I would love to have the Snoopy Peanuts Gang Christmas Light Show. I like the snoopy stuff animal. I like the Snoopy Note Sheets Caddy. I love the Peanuts Winter Fun with Snoopy ornament. Thanks for the opportunity to win! ! I love it all, so many happy childhood memories :). I think I like the Linus Shepard figurine the best! So sweet! I like the Peanuts® 2015 Believing Figurine! Love the Snoopy Stuffed Animal. I also love their Peanuts® Snoopy and Woodstock Hat! So cute! I need to have the 2015 Peanuts Believing Figure! I love the Nativity Set! I like the Snoopy itty bitty and the Snoopy and Olaf ornament. I didn't know Snoopy had a brother. I really like the itty bittys® Snoopy Stuffed Animal! I would love the Peanuts® Special Edition Nativity Set. I also really like the itty bittys® Snoopy Stuffed Animal! I like the Peanut Gang Christmas Lights Collection Ornaments. I like the Woodstock Peanuts® Gang Christmas Light Show. I like the peanuts boxes.